If you are looking for a villa which is walking distance to shops, restaurants and the beach, look no further than Villa Iriss! This great property is set in the traditional village of Polis and is the perfect choice if you want to experience the real Cyprus. The villa is spacious inside and out and has a beautiful garden to relax in. What's not to love? Air conditioning/heating in the bedrooms and WiFi are included in this 2 bedroom, 2 bathroom villa . Close to everything in Polis, this villa is a great choice for truly authentic Cyprus experience. Perfect location! The villa has a spacious outside area. The private pool is surrounded by lawn which is great for children to play on. The brick BBQ is next to the pool together with a small table - perfect for dining alfresco. The games tables are also here and great for everyone to enjoy. The main entrance to the property leads to an open plan lounge and dining area. The open plan living area has a traditional high-beamed ceiling and incorporates the lounge, dining area and kitchen. The lounge area has comfortable sofas and is a great place to socialise. Expansive patio doors provide an abundance of natural light into the room. The dining area is next to the fully equipped kitchen. Simple accessories and the owners own hand painted oil pictures add individual charm and character to this villa - a real home from home experience. There is 1 double bedroom with en suite shower room and 1 twin bedroom with a separate shower room in the villa. Both bedrooms are on the same side of the house with windows overlooking the garden. Located in the centre of Polis this villa is perfect if you don't want to hire a car. The bars, cafes and restaurants are only a short walk away from the villa. What's more, the pleasant sand and pebble beach of Polis is also a walk away. 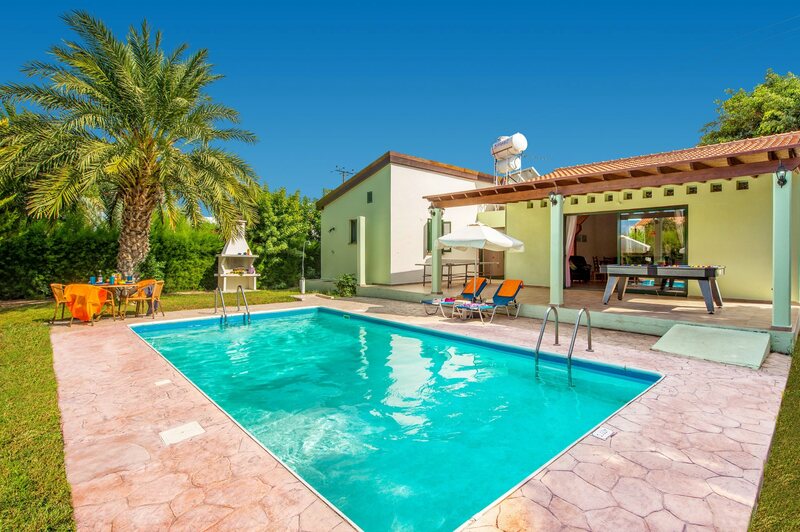 Our neighbouring villas Rosie, Clymentas, Poppy and Ibiscus are on the same street and great for families and friends who wish to holiday together but retain their own privacy. Polis square and its surrounding area has a number of shops but the ambience itself still remains laid back, calm and relaxed. You will find a big variety of shops in popular resort of Coral Bay, which is short drive away from the villa. The bustling town of Paphos is famous for its market and you can reach it in 20 minutes by car. It has a market, which is set in a maze of lanes selling an array of Cypriot fare including the local linen and lace. There is also a farmer's market in the old town of Paphos. At weekends, you can buy fresh fruits and vegetables, as well as items such as lace, leather bags, olive oil products, souvenirs and other local items. The building of the King's Avenue Mall has all of the top shops in one place. In the old town of Polis, which is a short walk away, you will find bars, cafes and restaurants to enjoy. If you are a fan of seafood try Latchi harbour tavernas. Asking for "the catch of the day" is a fish lover's delight. Or go to the popular resort of Coral Bay which has a big choice of local and international eateries. The sand and pebble beach of Polis is walk away from the villa. Alternatively, the beach at Latchi is a short drive away. The popular resort of Coral Bay caters for all and many forms of water sports and is about 20 miles away from Polis. Paphos Bird and Wildlife Park, and horse riding stables that are all a short journey west which makes a great day out. Paphos Old Town, with its maze of small streets, is ideal for a truly unique Cypriot experience. Kato Paphos has the harbour and is home to some of the most intricate mosaics in the Eastern Mediterranean. Northeast of Polis are numerous villages. Argaka has a lovely picnic area adjacent to the beach and is a perfect way to spend a day relaxing in the shade of the trees. Pomos is a small fishing village with stunning sea and inland mountain views. The small village of St George with its own little harbour and a handful of charming seafood tavernas is perfect for those seeking a calmer atmosphere than Coral Bay. The new area of Paphos, Kato Paphos and its harbour is home to some of the most intricate mosaics in the Eastern Mediterranean. There are also numerous activities to enjoy here and a variety of bars, restaurants, shops, the waterpark and nightspots to entertain. The Akamas Peninsular is a short journey west, by far the most beautiful location on Cyprus where you will find untouched landscape, amazing natural beauty, deep gorges and stunning sandy bays. In the opposite direction is the resort of Paphos. Villa Iriss is not available to book for season as it is sold out. Take a look here at the Cyprus villas that are currently on sale. Very pleased with the total package: booking, arrangements, the villa, the welcome from the local rep when she popped in to check that we were OK and the departure procedure. The villa was in a great location in Polis and the whole week was a delight due mainly to us having a pleasant and well-provided base, from which to explore the locality. The villa was well-equipped and very spacious. We will certainly consider using Villa Plus again. Well done and thanks for making our time in Polis so pleasant. Fantastic villa location, 10 mins walk to the beach and 10 mins walk to the local restaurants and pubs. Excellent large supermarket about half a mile away. Highly recommended location. Will book the same villa again! Have already booked same villa for 2013! A very satisfied customer. The location of these villas is excellent. I was very impressed with Villa Plus and the villa was well maintained and comfortable. I will use Villa Plus again. The villa is in a good position. It is very spacious, has a lovely pool and the grounds are kept tidy.